Nokia has only gone and done it. The Finnish firm, married to Microsoft and the Windows Phone platform, has launched not one, but three Android devices - and the Nokia XL is the daddy of the bunch. With a 5-inch display the Nokia XL dwarfs the 4-inch X and X+, but with a quoted price of just €109 (around £90, $150, AU$160) you'll struggle to find a smartphone this size for less. In terms of specs the Nokia XL arrives with a 1GHz dual-core Snapdragon processor, 768MB of RAM, 4GB of internal storage, 5MP rear camera and a 2MP front facing snapper. Considering the price it's not a bad setup, and the low internal storage can be boosted by a microSD card, plus the Nokia XL comes with dual-SIM capabilities. The main attraction on the Nokia XL is its operating system, which is built on the Android open source platform, although the heavy modification it's undergone means it's unrecognisable in terms of any Google affiliation. It's currently called Nokia X software platform 1.0.1 - not quite as clean or pretty as iOS 7 or Android KitKat, but it's a start. In fact Nokia has omitted Google's cloud in favour of Microsoft's services, making sure the Nokia XL still has a core integration with the Finnish firm's parent company. What does this mean then? Well the Nokia XL has a far wider range of applications than the Windows Phone-toting Lumia handsets, although you can't go through Google Play. Instead you have to use Nokia's own Store, providing a more handpicked selection of Android apps. If the app you want isn't there, you can always use third party stores to get your favourites onto the XL. Swiping from right to left on the lock screen takes you to the homescreen on the Nokia XL, which is made up of a series of tiles similar to Windows Phone. These tiles can be moved around by holding and dragging, and you can increase the size of your most important apps from 1x1 to 4x4. Some apps will also pull through additional details, such as the gallery showing previews of your images. As you move a tile around the screen the other apps dance out of its way, rearranging the whole shebang - although everything is a little jittery as the dual-core processor and 768MB of RAM struggle with the movements. I also found the Nokia XL took a while to boot up, and there was some noticeable lag when it came to creating folders and stick apps into them - vital for keeping your homescreen tidy. A swipe sideways from the homescreen takes you to the "Fast Lane", a running feed of all the latest activity on the Nokia XL, be it recently used apps, music controls or notifications of a new message, call or social interaction. The Fast Lane adapts to your usage the more you use the Nokia XL, and you can hide certain information to give you just the things which are important to you. General navigation around the Nokia XL tends to be smooth, but although it isn't the slickest of operators - considering its price point these are things I can just about accept. 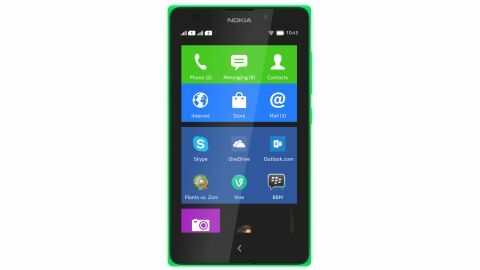 Instead of the likes of Google Maps and Play Music, on the Nokia XL you instead get Here Maps, Here Drive, free Mix Radio music streaming and Microsoft's OneDrive cloud storage. The large screen of the Nokia XL means it's ideal for viewing maps, and Nokia's Here service can save them all offline for browsing anytime, anywhere. At 800 x 480 the display on the Nokia XL isn't going to win any awards for clarity, but it still provides a decent viewing experience and I found text was easy to read. It does allow for better gameplay and movie watching - although quality won't be great. The handset itself follows Nokia's current design ethos of minimalist style and bright colours with orange, blue, yellow and green available alongside the more muted black and white options. It's quite blocky though, and at 10.8mm deep the Nokia XL is one of the chunkier smartphones around. I found the angular edges weren't overly comfy when held in the hand, although the mono body design is sturdy. You can peel off the coloured casing of the Nokia XL to gain access to the dual-SIM slots and microSD port, plus the removable 2000mAh battery which Nokia claims is good for 13 hours of 3G talktime, or 26 days on standby. The speaker on the rear of the XL can kick out music at quite a volume, but I did find it would distort if I turned it up too high. A centralised power/lock key resides on the right of the Nokia XL, just below a volume rocker switch, but unlike the Lumia range of devices there's no dedicated shutter button here. Nokia has loaded up the camera app with a buffet of features including colour effects, face detection and controls for brightness, white balance, contrast and saturation. I found the shutter and auto-focus to be a little slow off the mark, but the Nokia XL managed to take some decent pictures of the busy demo area. It's currently not clear whether the Nokia XL will make it to the likes of the UK, US and Australia, but the handset is confirmed for areas of Eastern Europe and other emerging markets. The Nokia XL is aimed at a narrow area of the market and it's a smartphone which will likely have big appeal in emerging markets, but less of a presence in more developed areas. A look at the price point and the spec sheet confirms this, but the fact Nokia has done a big screen device which has its roots in Android could be a sign of things to come from the Finnish firm.